On September 28, the Port Townsend Marine Science Center announced co-recipients of the 2018 Eleanor Stopps Environmental Leadership Award: Eloise Kailin, Olympic Environmental Council co-founder, and Sarah Doyle, the stewardship coordinator for the North Olympic Salmon Coalition. The awards were presented at the annual PTMSC Stewardship Breakfast at The Commons at Fort Worden State Park. 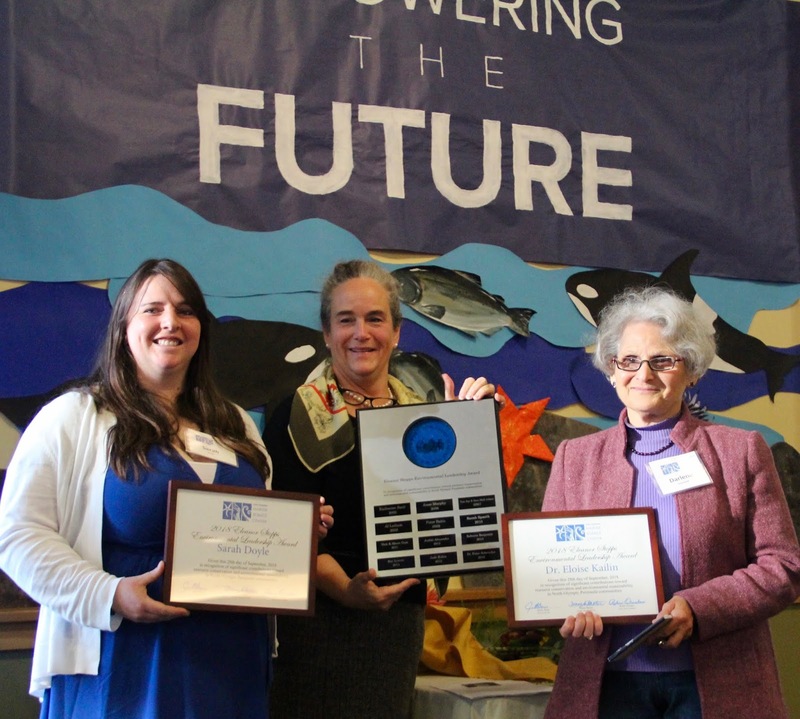 The prestigious Eleanor Stopps Environmental Leadership Award recognizes significant contributions in the protection and stewardship of the natural environment of the North Olympic Peninsula. 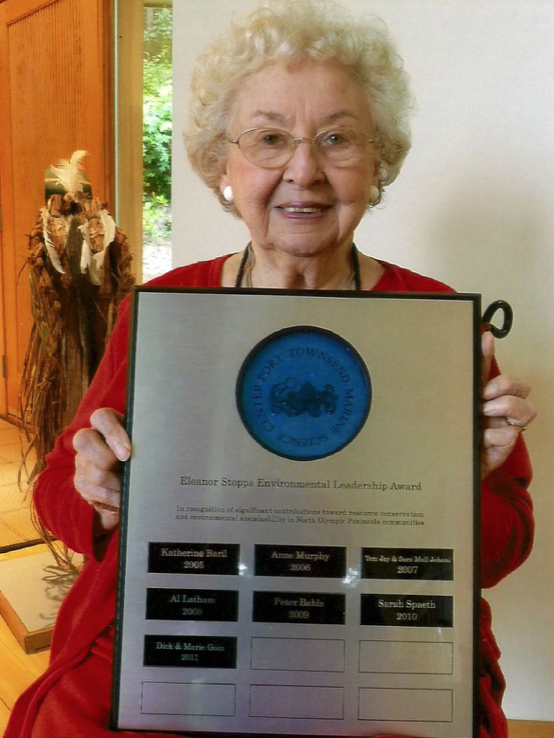 The award, now in its 14th year, pays tribute to Eleanor Stopps, whose vision, advocacy and determination exemplify the power and importance of citizen leadership. A physician by training, Eloise Kailin was one of the first advocates who recognized the role of environmental pollutants in human health problems. After a distinguished clinical career as an allergist and immunologist in Washington, D.C. -- where she also chaired the committee for the Metropolitan Council of Governments and testified on Capitol Hill for the Clean Air Act -- she retired with her husband to Blyn, Washington in the early 1970s. There, Kailin remained very active, serving on the Washington Environmental Coalition, leading the nonprofit Protect the Peninsula’s Future and co-founding the Olympic Environmental Council. -- A successfully negotiated agreement with the Port of Port Angeles for a public boat launch and park at the John Wayne Marina and the eventual replacement of creosote pilings. Sarah Doyle joined the North Olympic Salmon Coalition in 2009 as an AmeriCorps intern. She had an immediate impact through her work in riparian restoration along creeks, rivers and marine shorelines. She was also a catalyst for tree planting and the eradication of invasive plants, including the removal of butterfly bush along the Dungeness River. Doyle’s strategic approach has resulted in strong relationships with private landowners and collaborative partnerships with nearby conservation districts, land trusts and the Jamestown S’Klallam Tribe. Along the way she has secured funding for the NOSC’s Washington Conservation Corps, a six-person crew that undertakes restoration projects in Clallam and Jefferson counties. Doyle also works closely with youth, including 7th-grade students in Clallam and Jefferson County schools who participate in the “Real Learning, Real Work” project to restore local watersheds. From the 1960s through the 1990s, Eleanor Stopps was an active member of the Pacific Northwest conservation community. She founded the Admiralty Audubon Chapter and was a primary driver behind the establishment of the Protection Island National Wildlife Refuge in 1982, one of the few federally protected marine refuges established by an Act of Congress at that time. Today it is a critical habitat link in the preservation of the entire Salish Sea ecosystem, providing breeding grounds for pigeon guillemots and rhinoceros auklets, bald eagles and peregrine falcons, harbor seals and elephant seals, and myriad other species. 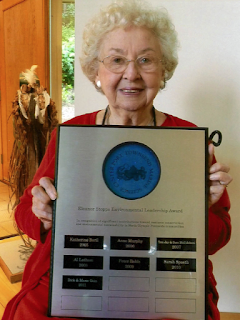 The leadership award created in her memory is presented annually to a citizen(s) of the North Olympic Peninsula (Jefferson and Clallam counties) who has led a successful resource conservation effort that benefits the North Olympic Peninsula and its residents directly; acted as a community catalyst for programs, initiatives or ventures that demonstrate a commitment to the future of the earth and its biodiversity; become a model for future leaders in business and education; or has been an exemplary citizen or policy maker who has implemented decisions that, though they may entail risks, have helped our communities take the next step towards environmental sustainability. The PTMSC has sponsored this annual award since 2009.